Be it the summer or any other season, having a bowl of ice cream always fills your heart with extreme joy. However, buying pints of ice cream all the time can even cost you a lot of money. At the same time, it is not easy to make ice cream at home. Well, that’s why you need to opt for ice cream machines. 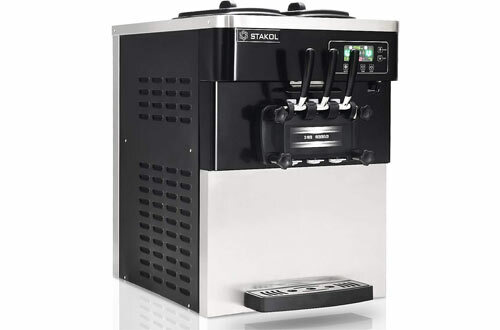 Above all, the ice cream machines are suitable for home as well as commercial usage. 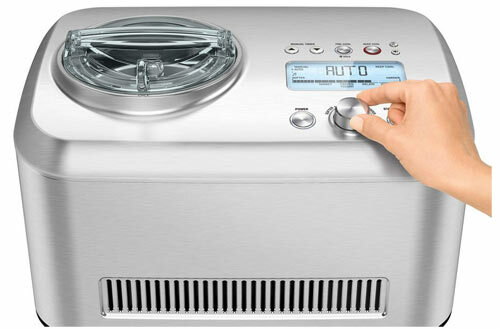 These machines let you prepare ice creams of different hardness as well as flavours and serve them without any hassle. 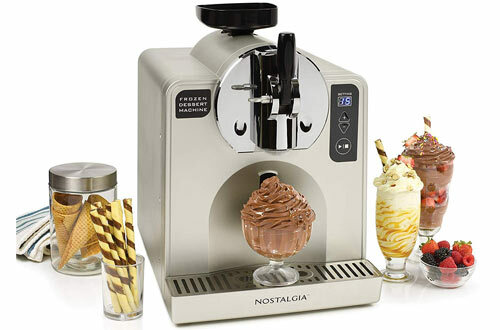 You can even create gelatos with the use of some of these machines. But the output, as well as unique factors, varies from machine to machine. And a customer being clueless about the features will definitely not know what to look for in these machines too. So, the ice cream machine guide acts as your ultimate saviour. In fact, you get to know all the details and reviews of best products. Whether you own an ice cream business or you want to enjoy some homemade creamy, cold delight Costway ice cream machine is your go-to product. 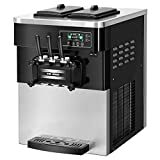 This is not only a commercial ice cream machine but also comes with strong Toshiba compressors that can freeze in a matter of minutes. With a power of 220W, the machine can produce up to three flavours- two single flavours and one mixed flavour. Besides, you can adjust the hardness of your frozen dessert to five different levels. In fact, the detachable tray keeps the ice cream from dripping and makes cleaning a whole lot easier. Also, a touchpad control panel with LED digital display gives a chic look to the machine and you can control the hardness, temperature and quantity with it. A one-click cleaning option is also present, that eliminates the burden of manual cleaning. Two 6L food grade hoppers help in meeting various demands at the same time. You not only get 2 different mode choices but also 5 different choices. 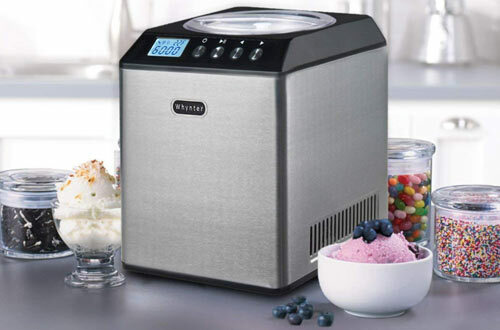 Cuisinart ICE-100 is a fully homemade automatic ice cream machine that can meet your fancies of delectable desserts including ice cream, gelato as well as sorbet. 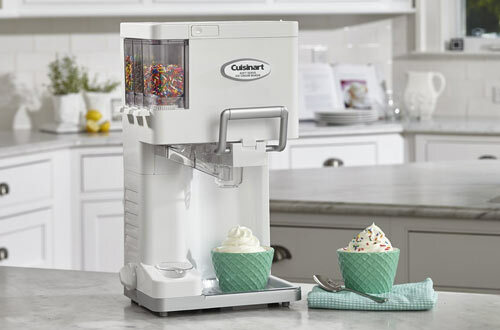 With a 1.5 quart capacity, this machine can, of course, churn out drool-worthy frozen dessert in no time. Furthermore, the two unique mixing paddles mix and aerate the mixture, thus creating light, fluffy ice cream that you can’t stop feasting on. Also, because the mixing bowl is anodized, pre-chilling is not required. In addition, the machine is completely BPA-free too. The machine has a touchpad LCD control panel with a timer ranging from 10 minutes to 60 minutes. A transparent lid helps in keeping an eye on the mixture as it churns. Due to the mix-in opening, numerous ingredients can be added while the mixture is churning. Rather, the machine also keeps the ice cream cool for 10 more minutes after the timer stops. 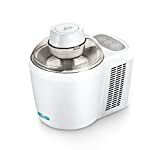 As a matter of fact, this machine with 1.6-quart capacity can whip out various decadent ice cream, sorbet, gelato, sherbet, frozen yoghurt in 30-40 minutes. 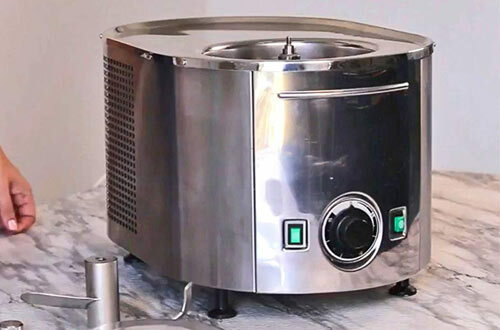 Nevertheless, the CFC-free compressors can freeze the mixture in very little time and removes the inconvenience of having to pre-chill the bowl. Moreover, the stainless steel exterior brings a sleek look. And it also prevents rust which makes the product appear brand new even after much use. The machine comes with a removable bowl as well as BPA free aluminium churn blades. With this product, you can prepare your favourite desserts with utmost ease. The machine’s unique motor drive is unique in nature as it shuts off automatically when the mixture is frozen solid, thus preventing damage. After all, the soft touch LCD control panel lets you control the actions of the machine in one press. You can now hear the timer owing to its audible nature. Here to meet your demands of soft-serve as well as frozen ice cream is the Nostalgia FDM1 with a capacity of 1 quart. Its automatic sensor begins stirring owing to its detection power of the cups and results in a smooth dispensing. Also, the strong compressors make cooling fast and hence the mixtures are frozen rather in no time. Further, you can pour in the mixture into the machine through a built-in funnel which is very easy to use and keeps the entire process mess-free. 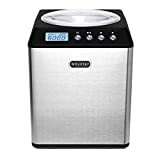 In fact, this electric ice cream maker machine for homemade purpose comprises of a LED control panel with nearly 30 functions with which you can create your choice of frozen yumminess. After the ice cream has been made, the machine can dispense the sweet dessert for up to 4 hours. It also comes with a removable drip tray which then helps in keeping the machine clean. Cleaning becomes easier with the integrated 2 stage cleaning function. In order to facilitate easy dispensing, it is again equipped with a pull-down dispensing handle. 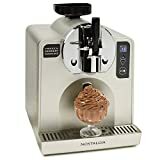 Armed with strong CFC-free ice cream machine compressors and a 2.1-quart capacity, the Whynter ICM-201SB can produce rich, creamy ice cream and gelato to satisfy your sweet-tooth. 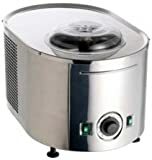 In addition, this energy efficient product can be operated in three distinct modes- ice cream mode, cooling the only mode and mixing the only mode. Even though it has a stainless steel exterior, it is the LCD touchpad control panel that brings a sleek look to your kitchen. 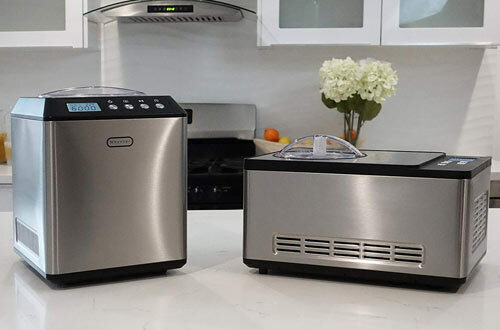 Plus, the machine is equipped with a unique feature that stops the motor drive instantly when the mixture is frozen solid in order to prevent damage. It’s BPA-free churn blades churns out creamy ice cream that you can enjoy with your family and friends. The detachable mixing bowl makes it easy to clean. Because of its small footprint appearance, it can be fit on small countertops or in cabinets. 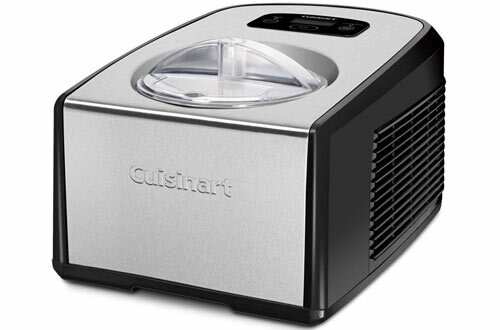 If you like to top your ice cream with crunchy condiments, then Cuisinart ICE-45 is the perfect ice cream maker for you. With three built-in condiment dispensers, you can choose your own delightful toppings that you want to store and serve. There are separate containers for small mix-ins like sprinkles and large mix-ins like chocolate chips or chocolate chunks. Next, the product’s 1 ½ quart freezer bowl has a double-insulated wall which results in even cooling. The mixture is churned and aerated in the bowl and within 20 minutes you can create your favourite dessert. Finally, the machine’s heavy-duty motor makes creating and dispensing ice cream an easy task. Provided that, the easy-lock lid can be removed whenever required. Also, ingredients can be poured directly through the transparent window and you can keep an eye on the mixture as it freezes. A cone holder lets you accommodate both flat bottomed cones and pointed cones for later use. Removable drip tray surely gives way to superfast cleaning. The product comes with a handle shaped like a bracket, pulling down on which you can get authentic soft-serve ice cream. 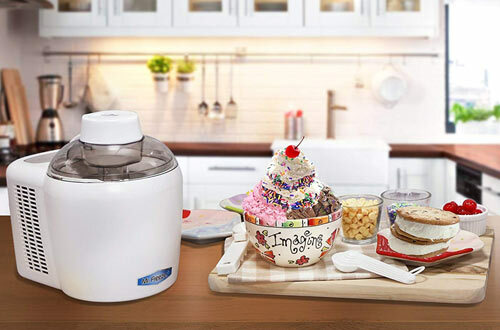 The Breville BCI600 XL is an ice cream maker that is automatic and can sense how hard a mixture has to be, on its own, based on the ingredients that it is fed with. Since it has 12 levels of hardness which makes it stand out from among other similar products. Because of an alert beep, it notifies you when the ice cream is ready; you can also choose from three different musical tunes. Moreover, its pre-cool setting gives you sweet delicacies in no time at all. And even the materials used for this product are all BPA-free too. Can contain up to 1 Litre of the mixture. 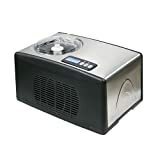 Contains self-refrigerating compressor of 165 watts for fast cooling by all means. Comes with child-lock as well. The dessert can indeed be kept cool in this machine for 3 hours. For silky sorbet, creamy gelato, delicious ice cream and other drool-worthy frozen desserts in minimum time, you can resort to the Lello 4080 machine. By pressing only two buttons, you can get 1- ½ quart confection in just a matter of 30 minutes. 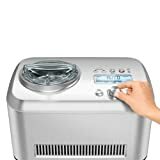 With 100 watt power, the machine guarantees easy and quick freezing. Since the mixing bowl does not require pre-chilling, you can start on a batch immediately after the other. Plus, the motor shuts off by itself if the dessert inside becomes too hard. Certainly, the stainless steel components make the product appear professional and assure sanitation as well as hassle-free cleaning. The timer especially helps you to adjust the time for variously frozen delicacies. Warranty of a year indeed guarantees the quality. The Whynter ICM-200LS comes with an extended cooling function that stops the mixture from melting even after the motor has been shut off. Because of its high capacity of 2.1 quarts, you can make almost double the amount of ice cream than the other similar products, in one batch. Overall, its powerful compressors and BPA-free churning blades produce intensely smooth and creamy desserts. Besides, the mixing bowl is also removable for which cleaning becomes a cakewalk. Lastly, it comes with an inbuilt audible timer that notifies you when the mixture is ready. Stainless steel exterior as well as LCD control panel accents your kitchen. The motor stops churning when the mixture is frozen solid, to avoid overheating and damage too. 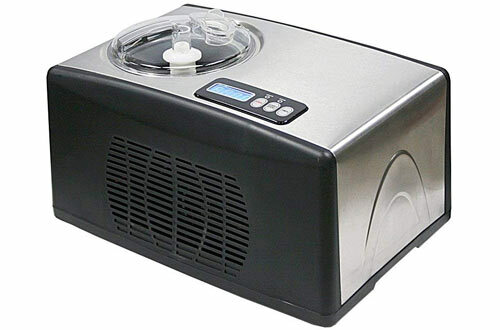 Equipped with thermoelectric cooling, this product does not require any compressor, CFC or freon for chilling any mixture. If you crave for silky, smooth, creamy ice cream, gelato and sorbet quite often, you can try out the Mr. Freeze EIM-700. Nonetheless, the transparent lid, of course, helps you to observe the mixture as it churns. In the same fashion, you can also adjust the softness or hardness of the ice cream as you desire. This ice cream churning machine can contain up to 1.5 pints of ice cream. With a power of 90 watts, it is also an energy efficient product to work within reality. A unique as well as a highly-advanced design too. 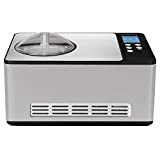 Now get the frozen treats just in few minutes as the homemade and commercial ice cream machines for sale will make the ice cream making the process easier.